The ‘reviews’ below are story summaries written sometime between 1995-1999. Ursula K. Le Guin. Forgiveness Day. Originally in : Asimov’s Science Fiction, November 1994. An Ekumen story set on Werel. Solly is constrained, an asset-owning woman in a male-dominated world. She, and a potential lover, have the chance to leave a lot behind in order to create a future for themselves. Originally in : The Magazine of Fantasy & Science Fiction, May 1994. Quee Lee and Perri are a couple on a galaxy crossing spaceship of immense size. With virtual immortality and luxury, there is a need to keep oneself from becoming jaded. The short lives of the Remoras, whose perilous existence on the outer skin of the ship, raddled and mutated with radiation, appears to offer a change of lifestyle. Originally in : Asimov’s Science Fiction, April 1994. Nancy Kress. Margin of Error. Originally in : Omni, October 1994. A woman frozen out of a research project and whose work was claimed by her sister, extracts her revenge. Originally in : Asimov’s Science Fiction, August 1994. William Sanders. Going After Old Man Alabama. Michael F. Flynn. Melodies of the Heart. Originally in : Analog Science Fiction/Science Fact, January 1994. A resident of a retirement home appears to have a good memory for some old songs – far too old for her to have remembered first-hand. And at the same time as he explores her longevity, the protaganist’s daughter is suffering from a premature ageing process. Terry Bisson. The Hole in the Hole. Originally in : Asimov’s Science Fiction, February 1994. A search for Volvo parts leads to a very strange auto parts shop, which is disposing of car tyres in a very novel way – through a portal to the Moon. Pat Cadigan. Paris in June. Originally in : Omni, June 1994. A vampire-like entity with a craving for human experiences. First Contact, with a plant lifeform. Joe Haldeman. None So Blind. Child genius Cletus Jefferson falls in love with blind violnist Amy Linderbraum. Her blindness triggers his interest in the workings of the brain and he identifies a means of boosting IQ dramatically. Near future Australia, with a private detective uncovering industrial espionage surrounding a drug which can ‘prevent’ homosexuality and related non standard sexual behaviours. Mike Resnick. Seven Views of Olduvai Gorge. Originally in : The Magazine of Fantasy & Science Fiction, October/November 1994. Far future aliens research Olduvai Gorge, one of whom is able to link through artefacts they find to scenes from the past. Seven scenarios which show the brutality of mankind are revealed, showing the menace that mankind was (and will be). Geoff Ryman. Dead Space for the Unexpected. Originally in : Interzone 88, October 1994. Office politics and Human Reseource Management taken to an extreme. Michael Bishop. Cri de Coeur. Originally in : Asimov’s Science Fiction, September 1994. Space Arks approach their final destination. Catastrophe befalls them on a macro level, on on a micro level a learning disabled child causes stress within a family. Howard Waldrop. The Sawing Boys. Hmm. I usually enjoy Waldrop’s humorous fiction, but this story didn’t do anything for me. Itinerant musicians chance upon a competition. Ursula K. Le Guin. The Matter of Seggri. Ekumen researchers go undercover on an alien planet in which gender roles are reversed and a man’s life is an often short and brutal one. Originally in : Asimov’s Science Fiction, October 1994 . Bizarre. Headaches lead the protagonist into a bewildering epoch spanning reality twisting journey. Originally in : Interzone 90, December 1994. An American liberal is in the UK when the extreme right USA revolts against democracy. Walter Jon Williams. Red Elvis. An Alternative Presley who is much more politically oriented than the King. Post quake California, with relationships sundered, and created, by the quake. A Hebrew prophet ponders his future and faith, and what may hinge on his decision. Brian Stableford. Les Fleurs du Mal. Originally in : Asimov’s Science Fiction, October 1994. Murder mystery in a hi-tech, genmod future. The sleuth in this case is one Oscar Wilde, and the killer is using a most unusual method of killing his victims. 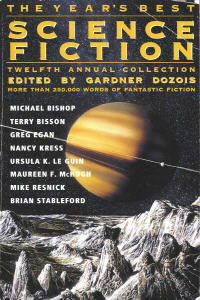 35 years but no longer counting :-( Reviews and listings of the annual mammoth anthology from Gardner Dozois.